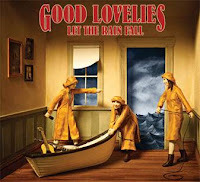 On February 22nd Juno Award-winning trio Good Lovelies return with their third full length album Let The Rain Fall. The Toronto group once again bring their combination of folk and roots with hints of jazz to create a charming playful mix. From the lead track "Made For Rain", the record oozes with hooks that seem yanked forward from a bygone era. Much of that comes from Good Lovelies' unparalleled vocal harmonies, reminiscent of '40s girl groups. There's a palpable Canadian atmosphere to the record. That's obvious from song titles like "Kingston", but there's more than that. In numbers like "Old Highway", there is an intangible earthiness that evokes images of our vast yet welcoming land. They even break out their French on "Mrs. T" to make certain to be wholly inclusive. You can't get much more Canadian than that. If there's a criticism to be made it's that, at 13-tracks in length, the album is a bit bloated. There are tracks like "Home" and "Every Little Thing", for example, that simply do not stand up compared to the rest of the record. As well, even though their cover of K-OS' "Crabbuckit" is a perfect choice for the trio's style, it feels incredibly out of place within the context of the album. It would've been better to save it as a one off 7" or compilation track. Nitpicking aside, with it's warm, cozy vibe Let The Rain Fall is the perfect album for a Canadian winter. It's not a bad way to fit a Sunday morning hangover either. Good Lovelies play the Great Hall in Toronto on April 2nd. Complete tour dates here. Best tracks: "Made For Rain", "Kiss Me In The Kitchen"